T Derek Sherrod participated in practice for the first time this season on Wednesday, which begins a three-week window during which he can practice without being on the 53-man roster. Sherrod was placed on reserve/physically unable to perform toward the end of training camp, the second straight camp he missed while rehabbing a leg in which he broke multiple bones back in Week 15 of 2011in Kansas City. That’s the last time Sherrod was in pads, and he’ll put the pads back on Thursday for the first time in 22 months as he continues what has been a long road back. 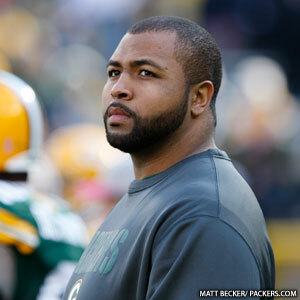 “It will be great to see that,” Head Coach Mike McCarthy said. The process will remain gradual, however. “The individual work will be good for him. How we integrate him into the team work is something we’ve talked about,” McCarthy said. With his three-week window to come off PUP underway, Sherrod will have to be added to the active roster by the start of Week 10 if he’s to play this season. Last year, he tried to practice around midseason for a few days but was never activated from PUP and missed the entire year. During the portion of practice open to the media, Sherrod physically was moving around far better than at any time last season. Having gone through multiple surgeries since the injury, progress has been slow but evident. CB Casey Hayward (hamstring) was also practicing on Wednesday, listed as a limited participant on the official injury report. Two weeks ago, Hayward practiced on a Thursday, then last week he practiced on Thursday and Friday. This was his first Wednesday practice, meaning this could be the first week he participates in all the workouts if he has no setbacks. There’s no official word on when he’ll be available to play, but he’s obviously getting closer. McCarthy said he needs “more information” to determine if Hayward is ready. “I’m just trying to get back in the same rhythm I was,” said Hayward, who had six interceptions as a rookie last year but has yet to play in the 2013 regular season. Hayward initially injured his hamstring before training camp, missed three weeks, returned for one week of practice, but then re-injured the hamstring in his first preseason game action. “We’ll try not to rush it back this time,” he said. “The first time, we didn’t think we rushed it back. I felt good when I came back. It was just a freak accident, and those things happen in this sport, especially with hamstrings. —Runnin’ with the ones: No real surprises as far as the depth chart goes. In the battle for the starting safety spot alongside Morgan Burnett, M.D. Jennings took the majority of the snaps with the first unit, but Jerron McMillian was rotated in as well. Same arrangement at right tackle, starting with Marshall Newhouse and followed by Don Barclay. Sam Shields was the starter at cornerback opposite Tramon Williams, and he could hold down that spot for awhile with Casey Hayward (hamstring) and Davon House (illness) missing practice. At running back, there was a steady rotation of work amongst Alex Green, James Starks, Eddie Lacy, Johnathan Franklin and Angelo Pease. —No first-day jitters: The Packers’ three highest-profile draft picks said they didn’t have any first-day nerves to deal with on the practice field. Neither Datone Jones, Lacy nor Franklin did anything particularly eye-catching, but their enthusiasm for their first pro training camp was evident. Jones brushed off even the idea of being nervous. Friday’s practice was in shells, and Saturday’s will be, too. The first day in full pads will be Sunday. —Sherrod hopeful: Former first-round pick Derek Sherrod says he feels “a heck of a lot better than at this point last year” in his recovery from a surgically repaired broken leg that cost him all of last season. He reiterated Head Coach Mike McCarthy’s hope that he can return to the field soon, but he’s not putting a timetable on it. Neal worked extensively at outside linebacker during OTAs and has slimmed down to help make the transition. He said he now weighs 275 pounds, down nearly 20 from his playing weight of a year ago. Neal said the coaches didn’t ask him to lose any weight but left the issue up to him. When he gets on the field, which McCarthy said could be a couple of weeks, it will be interesting to see if the Packers employ him more as an inside or outside pass rusher. Neal had 4 1/2 sacks last season as an inside rusher. The Packers will have to make a decision next week whether to activate offensive tackle Derek Sherrod to the 53-man roster or place him on injured reserve for the remainder of the season, and the 2011 first-round draft pick isn’t sure which way it’s going to go. Sherrod has been practicing for the past two weeks. On the physically unable to perform list from since the start of the season, Sherrod’s three-week window to practice without counting against the roster began during the bye week. He was on the practice field for the first time this season on Monday, Nov. 12, and has slowly been trying to get back to full speed. Mike McCarthy admitted last week that Sherrod was taking “baby steps” following the long and arduous rehab of his surgically repaired broken leg. He could not yet do drills at full speed but looked a little more nimble this past week. Considering the Packers have already lost starting RT Bryan Bulaga to injured reserve this year, if there’s any chance Sherrod will be able to play by season’s end, the Packers might want to put him on the roster. But if he’s simply been out too long and/or it’s not realistic to think he can play in a game, he’ll have to go on IR. “It felt really good to put the pads back on, put the helmet back on, be out there with the teammates,” Sherrod said of the past couple of weeks. “Just getting out there to work on the different drills, going through everything. Former first-round draft pick Derek Sherrod has gone through his first week of practice since breaking his leg in multiple places last December, and based on practice observations, he’s still not at full speed in the drill work. But Mike McCarthy said on Friday he’s not writing off Sherrod for 2012 just yet, even though he still has a lot of work to do to be ready to play in a game. Sherrod will get one more week of practice before the Packers will have to decide whether to activate him to the 53-man roster or place him on injured reserve for the remainder of the season. Sherrod’s work in practice has been limited to the individual drills. He has not taken any team (11-on-11) snaps. If Sherrod shows enough progress, the Packers could put him on the 53-man roster but carry him as a gameday inactive until he’s available to play. If the roster spot is needed, though, he may have to go on IR. That decision will be coming soon. In other injury news, TE Andrew Quarless (knee) has been ruled out for Sunday, while RB Alex Green (knee) sat out practice on Friday but is listed as probable. McCarthy said Green needed to rest his knee for a day after practicing three times already this week (Monday, Wednesday and Thursday), but he expects him to play in Detroit. Also, CB Sam Shields (ankle) and rookie LB Terrell Manning (shoulder) are both listed as questionable. Amidst the news that T Bryan Bulaga is out for the season, the Packers did get a few injured players back on the practice field on Monday. CB Sam Shields (ankle) and DL Jerel Worthy (concussion), who have both missed games in recent weeks, returned to practice. Also, T Derek Sherrod, who has been on PUP since the start of the season, has begun practicing. The Packers activated a three-week practice window for Sherrod during the bye week and will now have two weeks to decide whether to add him to the active roster or place him on injured reserve. LB Clay Matthews (hamstring), FB John Kuhn (hamstring), WR Greg Jennings (groin/abdominal) and DE Mike Neal were not practicing on Monday. 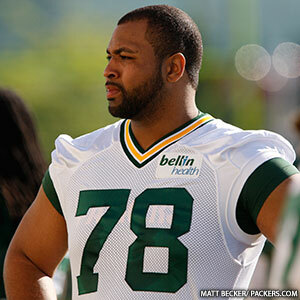 Neal played in the Packers’ last game even though he was listed on the injury report with an ankle injury. It is not yet known whether Neal is resting his ankle or if something else has cropped up. Mike McCarthy will be addressing the media after practice shortly. Offensive tackle Derek Sherrod, who remains on the physically-unable-to-perform list and hasn’t practiced in training camp, continues to give the same answer when asked when he expects to return to the field. “As soon as possible,” is the remark. So there’s no timetable established for Sherrod’s return. He is still rehabbing his surgically repaired broken leg, which he injured in Week 15 last season in Kansas City. 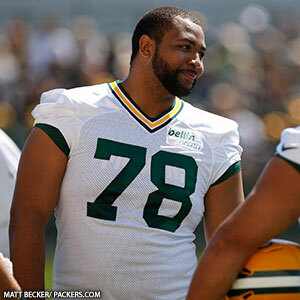 Sherrod was the Packers’ first-round draft pick in 2011, selected No. 32 overall out of Mississippi State. Update: Mike McCarthy said after Sunday night’s practice that Sherrod would not play in the preseason opener in San Diego on Thursday night.